Bubba Watson clinched his second Green Jacket in three years by holding off Jordan Spieth and Jonas Blixt to win the 78th Masters. The American left-hander shot a final-round 69 to win by three after overhauling a two-shot deficit on his co-overnight leader Spieth at Augusta. Spieth was bidding to beat Tiger Woods as the youngest ever winner and duelled with Watson for much of the day, but the Texan's chances were sunk in the water of Amen Corner and he carded 72 to end five under. Sweden's Blixt edged alongside Spieth with a 71, with Spain's Miguel Angel Jimenez fourth on four under after a 71. Americans Rickie Fowler (73) and Matt Kuchar (74) finished two under, with England's Lee Westwood (73) one under in seventh place, his 17th top-10 finish in majors. Northern Ireland's Rory McIlroy hit a three-under 69 to end level par and record his best Masters finish of tied eighth. 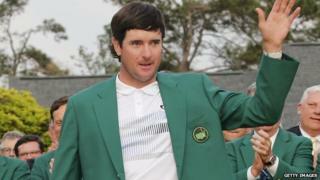 Watson became the 17th player to win two Masters titles, eight of whom have gone on to win three or more Green Jackets. Watson dropped a shot at the 10th after hitting a poor chip across the green, but the tournament dramatically lurched his way when Spieth's tee shot to the short 12th rolled down the bank into Rae's Creek, the graveyard of so many Masters contenders. Watson edged into a three-shot lead with a birdie on the par-five 13th and parred his way home for victory.